Your trending TOTS (Tips On TuesdayS) feature blog is going back to school with you this week, with something I’m personally super excited to have early access too as a LinkedIn Contributor, and get to share with you! 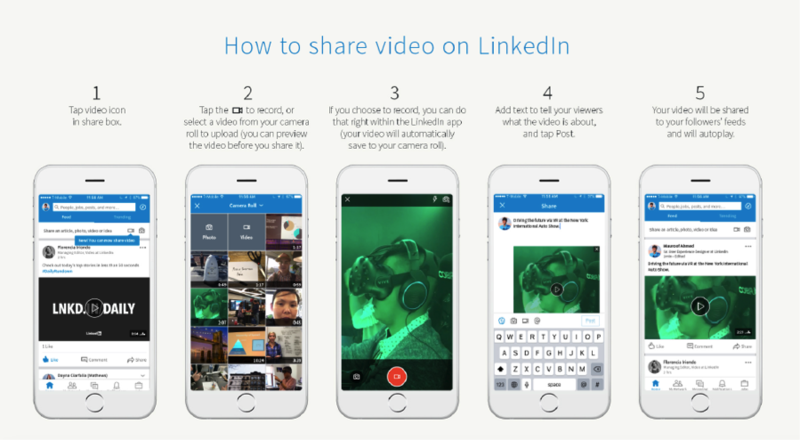 Today I’m going to be talking all about the brand new “Native Video” update that has just been rolled out on mobile for LinkedIn! Why am I so excited about this? Read on – this is like getting to have icing on the already amazing cake that the LinkedIn platform provides; and is really setting up your recipe for success with a brand new layer of savvy and strategic engagement with your connections. So, what is it – and why should you care when there is Snapchat, Instagram Live, and Facebook Live Video already? Well, first of all, this native video capability is more professional and streamlined. While you won’t be able to have puppy dog ears, fairy dust, and un-natural skin tones, you will be able to finally forego the traditional video uploading process of embedding third party links from other platforms – and most importantly, have an opportunity for digital ad marketing! According to Business Insider, this native video feature is the perfect compliment for your digital ad strategy with having the ability to broadcast company recruiting information sessions, keynote speeches, and professional mentoring for example. You can also use it to showcase a big conference or event you will be speaking at – and even who the keynote speaker is! This is also great for sharing about a new product or service launch, or an upcoming webinar being hosted. I recently showcased this in real time at a speaking engagement this week to highlight the mini LinkedIn workshop I was sharing tips about, and it was a fun and fabulous way to get my audience engaged with questions and comments. 3. Lastly, here are some final notes to keep in mind! Nervous about being on camera for Native Video? Don’t worry; we all can feel a little camera shy! Let's chat to discover which video option would be great for you!